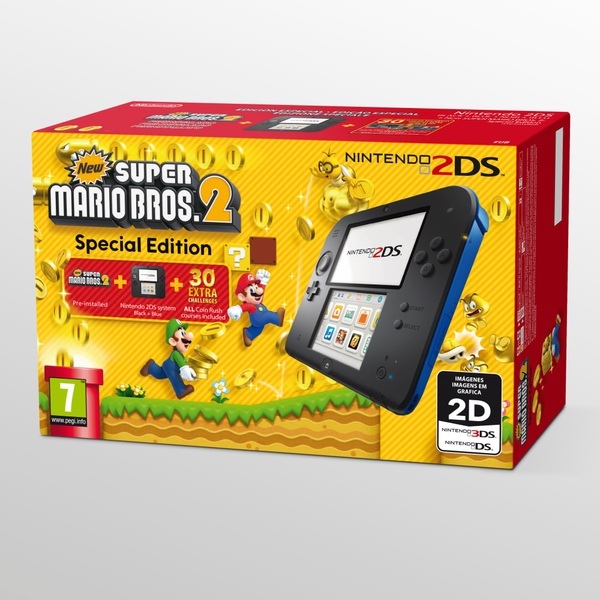 Bundle includes Blue/Black 2DS with preinstalled digital version of New Super Mario Bros 2. Nintendo 2DS , Offering you additional variety and value in your handheld gaming options, the Nintendo 2DS is a streamlined version of the Nintendo 3DS that will play games available for Nintendo 3DS, as well as Nintendo DS in 2D. New Super Mario Bros 2 As the first of the traditional, side-scrolling Mario games to be developed specifically for Nintendo 3DS, 3DS XL and Nintendo 2DS, gamers will find great mix of the familiar and the not so familiar when they play New Super Mario Bros. 2. New Super Mario Bros. 2 comes packed with more than 80 brand new courses which are stacked with all sorts of secrets and hidden surprises to discover. At first glance, its classic Mario platform action, but there are also some major differences to look out for – like the opportunity to collect an incredible one million coins for the first time ever! But the gold rush doesn’t end there, as there are three all new gold- themed elements that will help you out throughout the game. The first of these is the Gold Flower power-up, which sees Mario become the amazing Gold Mario. Not only does this transformation allow you to shoot Gold Fireballs at enemies and blocks, it will also mean you can turn them into valuable coins. In addition, if you’re quick enough, you’ll also get the chance to turn 10-Coin Blocks into special Gold Blocks, which can then be worn over Mario’s head to collect a steady streamof coins as he runs before the power runs out. The third option for collecting coins will come when you spot a Gold Ring on a course. You’ll need to be skilful enough to jump through it, but when you do you’ll see all your enemies turn to gold – then all you need to do is collect the additional coins they produce in their own unique way. Those who buy New Super Mario Bros. 2 will also be glad to hear that the game has retained some of the more classic elements of the franchise that have made it so popular over the years. This includes the Super Leaf power- up which changes Mario into fan-favourite Raccoon Mario and lets our hero float in mid-air attack, block enemies with a tail swipe and fly for brief periods of time. But there are plenty of new challenges and features to enjoy too including Coin Rush mode. This challenges you to collect as many coins as possible, but without failing once. This mode will really get your competitive juices flowing, as it selects three random coursesfor you to attack and only gives you one Mario to do it in. You can then store and share the results with others via Street Pass and pick up scores to try and beat. Theses collaborative and competitive fixtures of New Super Mario Bros. 2 will keep you coming back for more – even after you’ve managed to rescue Princess Peach!